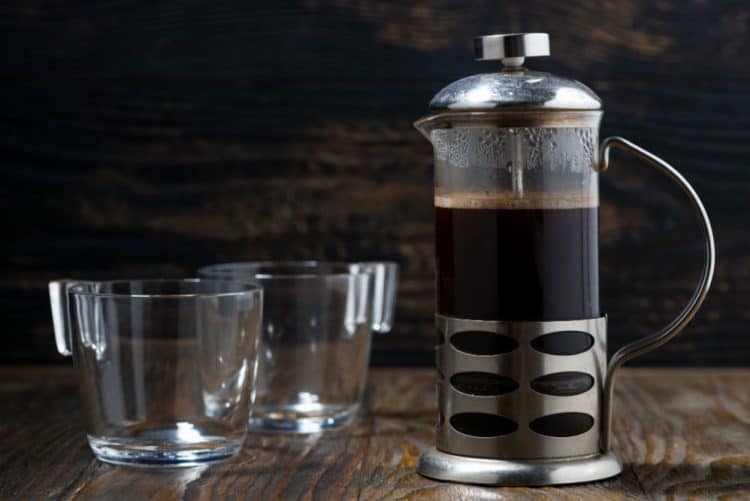 Some people might be embarrassed to ask the question “How to use a French press coffee maker?” because other people might think and say to them, “How hard can it be to press down a plunger?” But the truth is, it is not as simple as that. Using a French press is not as easy as just pressing down a plunger. In practice, it is just the actual motion that you do, but in theory, making a French press work at its best capacity also has something to do with preparation and the things in between before pushing the plunger. In order to do it correctly, you also should familiarize yourself with the different parts of a French press. This is also helpful when you need to set up a French press since you should know where each piece rightly belongs. Further, a bit of knowledge about the right coffee grounds can also make your French press coffee-making journey a success. With that said, we are going to talk about how to properly use a French press. We are also going to give you some techniques on how to make a good brew. Most importantly, we are going to discuss some aspects that can help with the use of a French press. There are a lot of sizes of French presses, and you have to know the capacity of your French press because it determines how much water and coffee grounds you should use. Keep in mind that you are not just filling up the carafe with water, which means space is also allocated for the coffee grounds. The water that you put in is not technically the volume of your coffee once you finish brewing. Usually, the amount of water and the coffee grounds are indicated in the instruction manual or the packaging of your French press. Do remember that when they say cups, they do not pertain to regular sized cups. They are referring to those little French cups. A key component to learning how to use a French press coffee maker is to have the right ground of coffee. To do so, you first have to grind your coffee. There are two kinds of grinders, the first one is the blade, and the other kind is a burr. The blade kind is hard to manage as it only has a simple mechanism. The more you grind, the smaller the pieces of the coffee beans get. The problem with this is the fact that the grind is inconsistent. When it comes to the burr kind, you can get your coffee beans to have a sandy consistency. At the same time, their sizes are the same. Apparently, there are pros and cons to each kind. As for the blade, you get to have a more robust flavor; however, you risk trial and error in the brewing method itself. On the other hand, if you use the burr kind, it is easier and faster to brew, but the taste can somehow be mild if you “over burred” the coffee beans. Here are the easy steps that are by default will give you an excellent tasting coffee. However, you can adjust the taste by just adding or removing coffee grounds. It is best to use slightly cooler water than that of a boiling one. This is the case as using boiling water can “shock” the beans. In doing so, the beans might not release its aromatic oils. Using fresh water is also best. Do remember always to use freshly ground beans because it makes a huge difference in aroma and taste. You must also determine what type of grind to do. If you are a beginner, go for a coarse grind and just adjust the taste of the coffee with sugar or creamer. If you want to adjust the taste while in the brewing process, you can change the grind of the beans. Coarser grinds call for a stronger flavor, while fine grinds will give you a mild flavor. Rule of thumb is to put two tablespoons of coffee grounds for one cup of coffee. As for the water, eight ounces of water is already enough for a single serving. Pour the water evenly on the grounds and slowly mix it. Make sure that the grounds are properly immersed in water. Once you are done steeping, press down the plunger slowly. Remember to do so at an even motion and angle. This process is essential because if you mess it up, the grounds can escape the filtration system and you have to repeat the process to have clean coffee. Proper pressing of the plunger will also reduce the stirring of your brew. Pour out your coffee into your favorite cup! It does not stop there. Once the French press is empty, you have to immediately clean it because leaving the grounds in there for too long can affect the integrity of the interior of your French press. It is not so easy, right? There are some technicalities that you first have to master before you get to press your coffee. But do remember the rule of thumbs when you are first starting out, and you will not get lost. Once you get the hang of it, you can then adjust the grind of the beans and the steeping time. You might be surprised that you are even making your own technique in pressing down the plunger. With that said, making good coffee takes time, so be patient with all the processes that we mentioned and rest assured, your patience will be rewarded with great tasting coffee.